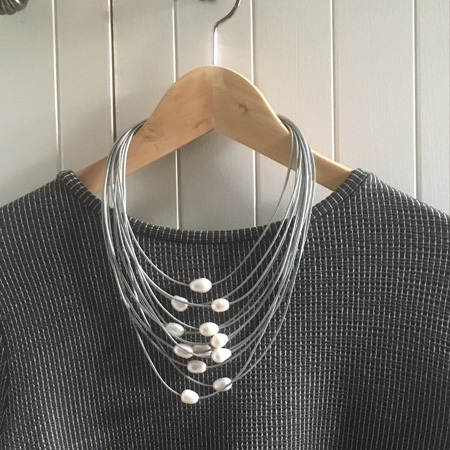 A grey leather and pearl necklace in a beautiful shimmering grey colour. This pearl necklace has 12 fine leather strands threaded loosely with large oval freshwater pearls. The leather strands are a shimmering grey colour and the strands have cascading lengths to give the necklace a substantial look. The pearls are 9-10mm and the leather strands are between 45-55cm long and closes with a magnetic lock. To complete the look get the matching bracelet.